Yes, it was another fancy dress party. 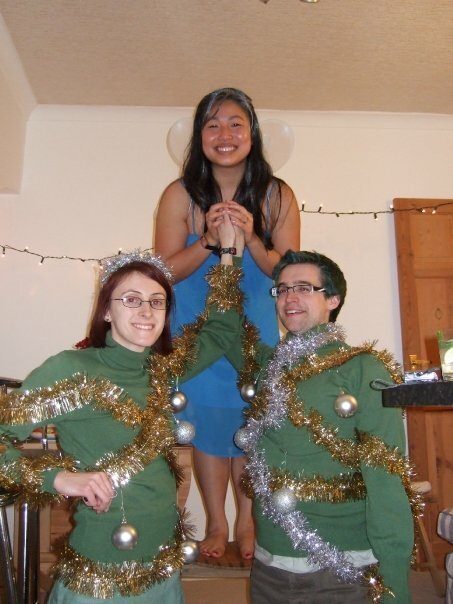 Go Team Christmas Tree! Who doesn’t like zombies? No-one, that’s who. Unless, of course, you’re running for your life from them, which is exactly where you find yourself in the co-op centric Left 4 Dead. Taking on the role of four armed survivors of the zombie apocalypse, you move from safehouse to safehouse searching for an escape from The Infected. Between safehouses the path is anything but hospitable; zombies are everywhere. On their own they are manageable, but an onrushing horde is enough to cause crosshairs to wave wildly in panic. A cool head and teamwork is vital to survival. Those running off alone will only last so long before the pack attacks and separates you from the safety of your friends. It may not be on a par with Rainbow Six when it comes to checking corners and clearing rooms, but you need your buddies close to apply first-aid and pull up those who have been knocked down. Plus the trivial matter of helping keep the undead at bay. The experience of seeing of your first horde descend is a memorable one. There are no slow, pondering zombies here. Expect a sprinting 28 Days Later style that will pour from the surroundings in their droves. Bicycle clips are recommended. As well as your standard Infected zombie model, there are also Special Infected. Taking the shape of large tanks, swift hunters and ranged smokers that can lash you from a distance with their tongue. Each has their own distinct cry and all can incapacitate a member of the group in their own special way, causing the rest to concentrate their efforts on freeing their comrade before it is too late. The introduction of these special types keeps everyone on their toes, awaiting the noise through the trees that signals a hunter’s approach. Worst, though, is the Boomer who can turn a moment’s calm on its head. A huge, obese monster whose vomit attracts vast swathes of zombies from seemingly nowhere. Taken out at range they prove no bother but yards from a safehouse with low ammo and low health they can be a downright pain. Disappointing, Left 4 Dead only has four chapters, each taking roughly an hour to complete. Its replay value comes from an “AI director” that spawns Infected as and when it sees fit. Dawdling too long will probably provoke a zombie rush, but take too much punishment and the director might ease off giving you time to regroup. Whilst this does add variety and unpredictability, it doesn’t seem enough with the blandness and linearity of the levels and your mission. A different dimension is added to the experience through the adversarial mode, where you are placed in control of the Special Infected. Being far weaker than the humans, Infected must play cat and mouse with their prey. Charging in alone is a definite way to see the respawn screen very swiftly and so waiting in ambush or following in on a horde rush are your best methods of getting the brains you desire. Played offline Left 4 Dead is a midly interesting affair but ultimately just an average shooter. Played with friends the experience is definitely lifted, but no matter how much the AI director plays with the game’s tempo those spending extended periods with the game will be retreading an awful lot of ground. Last year, Bioshock became the darling of the gaming world because it combined a beautiful but tortured historical aesthetic with an engaging narrative. 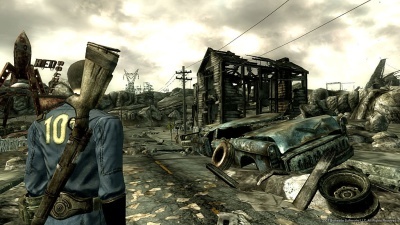 Whilst comparisons with Fallout 3 may at first seem misguided, they both share very similar themes: a world in ruin, an unlikely hero with a series of moral choices, and an art style set in the recent past. Not wanting to give too much away, but Fallout, like Bioshock, is an exceptional title. As the opening cinematic fades away, the initial scene reveals a very unique experience: that of your own birth. Part of the quality of Bethesda’s epic RPG is the seamless way it weaves in the character creation stages, and what could be more natural than birth? It continues through childhood with important events shaping the adult who you will become: a toddler’s ABC book will assign characteristics whilst skill points will be gifted through school tests. Even the introduction of your Pitboy 3000 – your inventory manager, guidance system and quest book – is handled in the manner of a birthday present. The style of the forthcoming adventure is molded through these handouts and there is plenty of scope to create a wide array of characters. From hackers to brawlers, marksmen to scientists, the world can be tackled in a variety of ways, each with their own strengths and weaknesses. This period of growth does a wonderful job of rolling out the Fallout universe, too. It is a world in a post-apocalyptic state where the denizens of the US have sought shelter in giant underground vaults. However, with the stage set in your cozy subterranean home, everything is turned upside down as your father decides to leave the safety of Vault 101. Keen to find out just why he abandoned his only child, you follow in his footsteps and set off in pursuit across the dangerous Capital Wasteland. It is here where the game starts to shine. With the shackles of the vault cast aside, you stand on a hillside surveying a scene of utter devastation: buildings torn asunder, bleak landscapes and nothing but a gray palette for miles. Coming from the colour-rich Fable some may feel subdued by this depressing panorama, but the sense of freedom is immense. Whereas Oblivion’s landscape was usually curtailed by hills, forests and city walls, Fallout hides nothing of its desolation. More often than not you can see far, far into the distance. Glimpses of strange buildings and settlements lurk in the distance, pulling you from your goal with the sheer intrigue of what they might hide. As soon as I emerged blinking into the light, I took one look at my primary objective and promptly marched off in the opposite direction. Nearly a dozen hours passed before I took my first steps towards seeking out my father. Whether that makes me a bad son I do not know, but in the meantime I discovered abandoned towns, happened upon hidden weapon caches and had run away from more than one giant scorpion. For those focusing solely and millitantly on the main storyline they’ll be able to polish off Fallout 3 in roughly ten hours. Kudos. They’ll also be depriving themselves of exploring a rich world populated with colourful characters. Wandering the barrens introduces many communities hidden away. Scared slaves living in ruins, an undercity full of mutants and towers housing the pre-war upperclass. Many have a tale to tell, some may even partner up with you, and searching for these groups often opens up quest chains that tells the story of the Wasteland yet further. The sheer variety and detail of these quests is impressive. Players will rarely feel like they are facing the same challenge twice, aided and abetted by the narrative and their branching nature. Case in point, when asked to remove a troublesome ghoul, said ghoul also has a story to tell. Do you then continue with your orders to off him or is it now far more lucrative to keep him alive? Whose word do you value most? Should you follow the path of greed or righteousness? Choices, choices. Although your early stat distribution will have shaped your character in one of many fashions, a good majority of quests are ultimately resolved by gunfights. Whilst it may be feasible to stealth around hordes at night and hack your way through security doors for sneaky shortcuts, lead will eventually fly. There are situations that can be resolved through diplomacy or cold hard cash and they are refreshing when they crop up, however, it is always worth dropping a few skill points into firearms not matter what the chosen character build. What saves this adventure from turning into a sprawling shooter is a system called VATS. 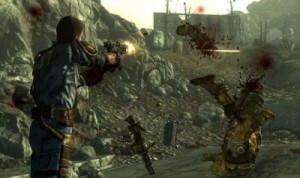 Entering VATS will freeze time and combat will change to an almost turn-based system where individual body parts can be targeted. Each will show the percentage chance of hitting and so the trade-off must be made between the high-risk, high-damage head and the relatively easy but more durable torso. To maintain balance, using VATS costs action points, which take time to recharge. Once all are spent then combat reverts to a more traditional shooting mechanic. The basic FPS controls are not the game’s finest moment and so the mix works well. Players can choose between holding back for their recharging action points or charging in ala Quake, each giving their own experience. Whilst combat may still be a work in progress (although a step up from Oblivion), Fallout 3 is ultimately an immersive world where it is possible to lose yourself for hours upon hours. Drawn in by tales of survival and the vast map just begging for exploration, the goodies that lie at the bottom of long abandoned vaults and the search for your missing father, there is so much to do it is hard to see a better value game this year. For those of you who lost your lives to Oblivion, then prepare to do so again. Those who did not, and I was amongst your number, I would still consider putting Fallout 3 at the top of your Christmas list; it will keep you going long after the last of the mince pies have been eaten.